Thank you to all who have sent their love, congrats, and prayers our way. We have read every comment, email, message out there. In the meantime, we are just so blessed and taking this time to soak this bundle of joy in. And yes, big sister is OVER THE MOON and is absolutely smitten by her little brother. Congratulations Becky! He is just perfect! Oh, how sweet is he?! So happy for you and your family!! Congratulations! He is ADORABLE! Glad that you and your family are doing well! He is precious! Congratulations on your new blessing and Conrats to E for becoming a big sis! Congratulations! He is a handsome little man! Congrats Mama!! He is just perfect!! Enjoy your sweet little family! Congratulations! I can't wait to read updates, see new pictures, and read Graham's birth story. You've got a gorgeous family. A cutie pie for sure!!! Looking forward to his birth story and first meeting with big sister!!! Congratulations mama and papa! CONGRATULATIONS!!! Can't wait to read your posts about him! Congrats. Yesterday really was an amazing day for so many people. OMG look at that squishy face, I wanna kiss it! Congrats to you guys, Becky! He is absolutely adorable! Ugh, he is so perfect! :) so excited for you!! Welcome to the world handsome little man!! Congrats! He is just precious!! Congratulations to you all. Glad everyone is doing well. Enjoy every second! How exciting that he was born on the exact day you hoped! Listening to his mama already. Congrats and welcome to the world Graham (also my little boy's name)! Congrats again Becky.... I have no idea how you find time to make your blog post look this cute :) Good for you! haha! Congratulations. Best Christmas present ever! Congrats girl, he is beautiful!! Oh my goodness - he's so perfect!! Congrats to you & your family he is adorable! Congratulations!! What a precious little man! Congrats! He is so sweet! Yay!!!!! Congrats!! SO happy for your family! Baby G is perfect and SO happy E is embracing her big sister role!! Did you go into labor on Christmas? He is so adorable and perfect Becky! 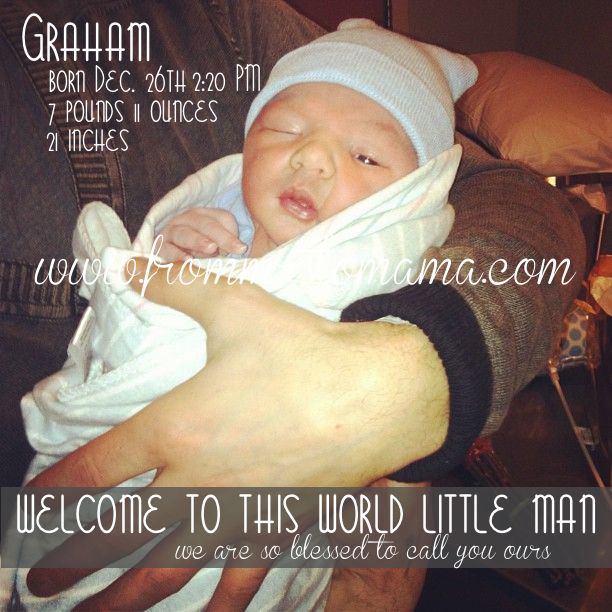 CONGRATULATIONS :D Welcome baby Graham! Congrats!! So glad all is going well! Congratulations :) He is adorable! COngratulations!! What a wonderful Christmas present! My son was due on 12/26 last year but didn't come until 12/30. There's something special about Christmas babies. Can't wait to see more pictures!! He's adorable. Congrats, congrats!!!!!! So happy for you and your perfect family!! So perfect and beautiful! :) Congrats!! so sweet! Congratulations! Little boys are the best! We're birthday buddies!!! Love him already...he's beyond precious!! Congratulations! He looks wonderful! I hope you are both feeling well! How cute is he?! Congratulations! What a doll baby! Congratulations to you, Dad, and big sister! He's so cute. Congratulations on Gramham birth, cute picture one eye open.